Description: For Her. Characteristics: Inspired by a Chinese Garden of Eden, Fleur d'Osmanthus Eau Fraiche displays a cascade of appetising floral notes, with citrus fruit and wood. This bunch of.. Description: Scent and illuminate with the Roger & Gallet Sublime Or Fresh Fragrant Water Spray, a delicately perfumed treat for the skin. 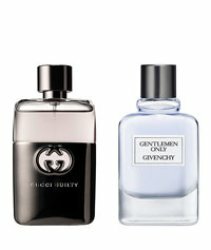 An added treat – the fragrance is infused with delic.. Description : For Her. Characteristics: Inspired by a Chinese Garden of Eden, Fleur d'Osmanthus Eau Fraiche displays a cascade of appetising floral notes, with citrus fruit and wood. This bunch of.. Description: For her, for him. Characteristics: With Ginger Eau Fraiche, succumb to the exuberance of Indian gardens. Allow yourself to be aroused by the magic of maharajahs' palaces, the sensual.. Description: For her. Characteristics: From the dream of an Indian garden was born Rose Eau Fraiche... As caressing as the silk saris of Bengal, as limpid as the fountains reflecting the palac..